Presenters Warren Beatty and Faye Dunaway apparently took the wrong envelope — the one for best actress winner Emma Stone — onto the stage for the final prize. When they read “La La Land” as the winner, representatives for ballot tabulators PwC — formerly Price Waterhouse Coopers — realized the mistake and raced onstage to try to stop the acceptance speeches. 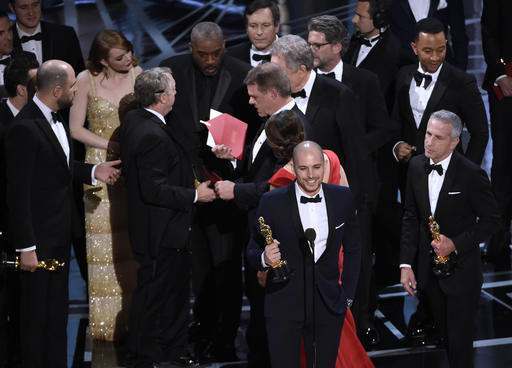 Host Jimmy Kimmel came forward to inform the cast that “Moonlight” had indeed won, showing the inside of the envelope as proof. “I knew I would screw this up,” said Kimmel, a first-time host. Gasps were heard around the auditorium. Presenters, winners and Academy of Motion Pictures Arts and Sciences huddled to discuss the debacle. Beatty refused to give up the envelopes until he could hand them first to Jenkins. “La La Land” director Damien Chazelle and Jenkins hugged amid the chaos. “It was unfortunate that things happened as they did but, goddamn, we won best picture,” the still cool and composed Jenkins told reporters. For “La La Land,” a musical in which reality repeatedly intrudes on fantasy, it was another alternate ending. “La La Land” still collected a leading six awards, including honors for cinematography, production design, score, the song “City of Stars” and best director. Chazelle, the 32-year-old filmmaker, became the youngest to win best director. “This was a movie about love and I was luckily enough to fall in love while making it,” said Chazelle, speaking about his girlfriend and Oscars date, Olivia Hamilton. Up until the frenzied end, the telecast had seesawed between jabs at Donald Trump and passionate arguments for inclusivity. “All you people out there who feel like there isn’t a mirror out there for you, the academy has your back, the ACLU has your back and for the next four years we will not leave you alone, we will not forget you,” said Jenkins, whose film is, in three chapters, about a young black kid growing up poor and gay in impoverished Miami. Shortly later, Affleck — in one of the night’s most closely watched races, won best actor — his first Oscar — for his soulful, grief-filled performance in Lonergan’s film. Affleck and Denzel Washington (“Fences”) were seen as neck-and-neck in the category. An admittedly “dumbfounded” Affleck looked shocked when his name was read. “Man I wish I had something bigger and more meaningful to say,” said Affleck, who hugged his more famous brother, Ben, before taking the stage. The show kicked off with Justin Timberlake dancing down the Dolby Theatre aisles, singing his ebullient song, “Can’t Stop the Feeling,” from the animated film “Trolls.” It was an early cue that the Oscars would steer, at least in part, toward festiveness rather than heavy-handedness. Protests, boycotts and rallies have swirled ahead of Sunday night’s Oscars. But Kimmel, in his opening monologue, quickly acknowledged that he “was not that guy” to heal a divided America. Viola Davis, co-star of Denzel Washington’s August Wilson adaptation “Fences,” won best supporting actress. She and Ali, both widely expected winners, marked the first time in more than a decade that multiple Oscar acting honors went to black actors. The evening’s most blunt protest came from a winner not in attendance. Best foreign film for the second time went to Asghar Farhadi, director of Iran’s “The Salesman.” Farhadi, who also won for his “A Separation,” had said he wouldn’t attend because of Trump’s travel ban to seven predominantly Muslim nations. Anousheh Ansari, an Iranian astronaut, read a statement from Farhadi. Mel Gibson’s World War II drama “Hacksaw Ridge” was, surprisingly, the evening’s first double winner, taking awards for editing and sound mixing. Gibson, for a decade a pariah in Hollywood, was seated front and center for the show, and was a frequent presence throughout. The “OscarsSoWhite” crisis of the last two years was largely quelled this season by a richly diverse slate of nominees, thanks to films like “Moonlight,” ”Fences” and “Hidden Figures.” A record six black actors are nominated. For the first time ever, a person of color is nominated in each acting category. Associated Press’ Sandy Cohen, Lindsey Bahr and Matt Sayles contributed to this report.